Facebook users are finicky. But they get more friendly as you learn how they think. It’s one thing to engage people to like, share or comment on a post in their News Feed. But it’s something else entirely to get them to click a link to be taken away from it. Most people browse Facebook while they’re taking a break, on the bus or are in some other situation where they need to kill a few minutes or seconds. This means they’re expecting to view things that can be digested quickly, like photos and short text updates. This type of Facebook post is meant to tug on a person’s curiosity. It makes them want click a link to see or read something that are getting just a small preview of in the post itself. A photo that shows a small piece of a larger, more intricate object. This can include a location, a product, an outfit or even a piece of content. A short description of what the photo shows and a call-to-action to see the rest of it. 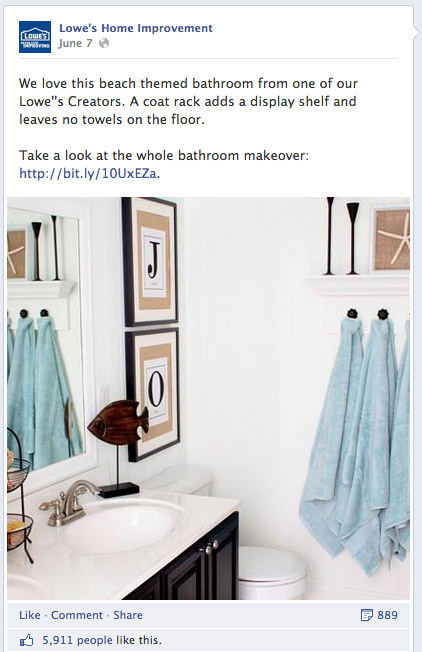 Lowe’s Home Improvement does a great job using this formula to promote a bathroom makeover. Posts like these that provide real-world ideas for doing cool things are perfect. And people are always interested in seeing a makeover. Before-and-after photos have big impact on people’s minds because they show what is possible in a believable way. A photo of a beautiful kitchen is nice, but if you add a photo of how the kitchen looked before it can spark new ideas in your Fans’ minds on how they can do a makeover of their own. Contests and free giveaway are great incentives. Providing the chance to win a prize will drive a ton of clicks - and won’t require much brain power to create. These posts may seem straightforward, but I’m always surprised at how much optimization can be done to improve a post’s click-through rate. How do you optimize this type of post to drive clicks? 1. Keep the amount of text to a minimum. A lot of times I see businesses make these posts but fail at them because they want to provide too much information about the prizes or how the contests works. Save those details for the contest entry page! For the post all you need to say is that you’re running a contest and what the prize is. This will make it easy for the reader to digest the post quickly and make them want to click on the post to find out more! Looking for contest inspiration? 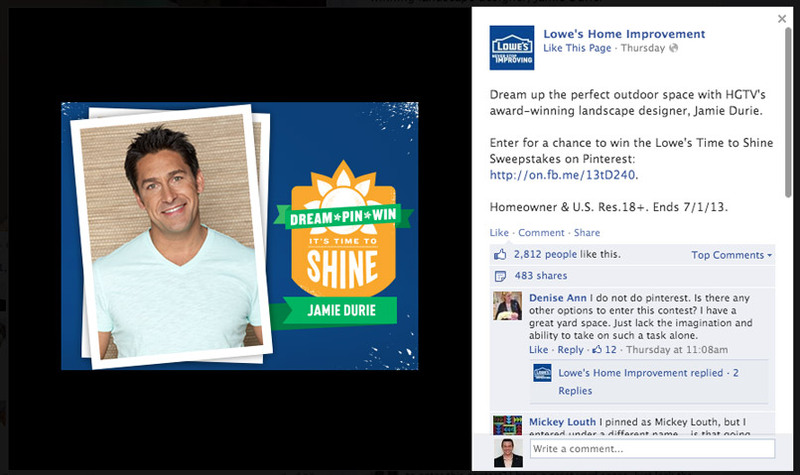 Check out 25 Creative Facebook Contest Ideas You Can Use Today. This type of post gets people thinking about a goal they’re trying to achieve: be it a successful business, a healthy body, or a more product work life. It provides them with a way to reach their goals - normally in the form of an ebook or video. One of the reasons Pinterest is so popular is that it is an idea machine: It gives people tons of ideas and examples on new and interesting ways to do things. Making your Page a source for cool new activities and tips for things that are relevant to your target audience is the best way to create lasting engagement with your Fans. 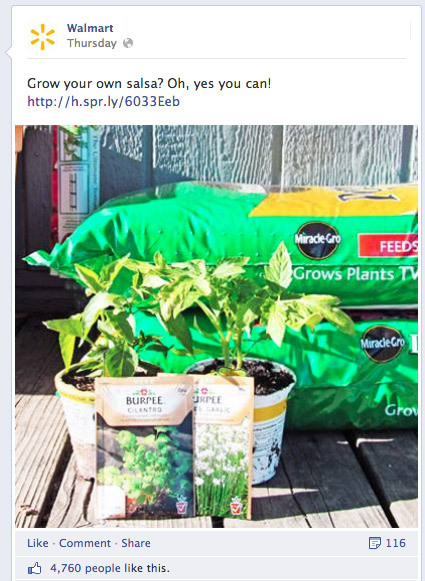 Walmart made a killer post recently with a link to a guide on growing your own salsa. Many people in their target audience (families) have gardens at home, but probably never thought to grow the ingredients necessary to make their own salsa. This will provide them with a new activity they never thought of trying before. Problem-solving posts are amazing for creating a beloved business. Providing easy and real solutions to common problems of your fans can brighten their day and make sure to stay tuned to whatever you have to say. Remember, everyone has a pain that can be alleviated. Lowe’s knows that for most DIYs (Do-it-yourselfers), using tools can be difficult. 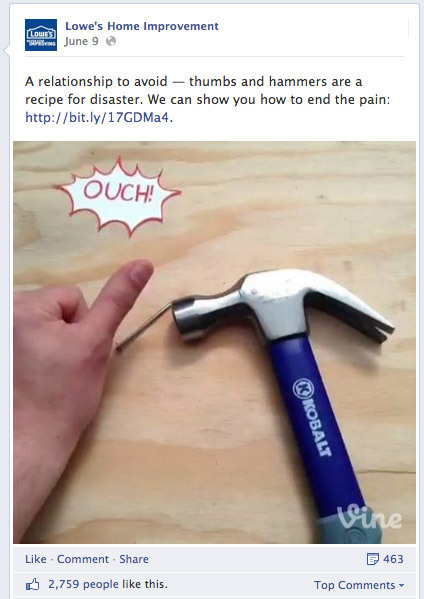 In this example they’re providing a solution to one of the most common problems: hitting your thumb with a hammer. I think the “OUCH!” is a nice touch to make people remember the pain they’ve felt and yearn for a solution. 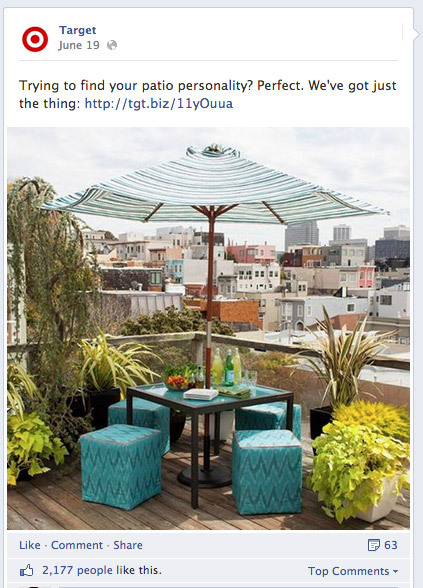 Target used this formula to create a highly product-centric post to promote its patio furniture. This one can be tough to do without seeming like a full-on product advertisement. But if you do it in a way that truly provides, what Jay Baer calls, Youtility to your fans, then it’s ok.
Are you having trouble getting your flower garden to blossom? See how [Product] helped our customers grow their beautiful home garden: [LINK] (Photo of customer’s garden below). Other than coupons and giveaways, “First-time/behind-the-scenes/exclusive” things are the top reason people “Like” businesses on Facebook. When they become your fan they want to feel like they are part of an exclusive club. They want to be the first to know about exciting new events, products and people. Photos of food are shared more than any other kind of photo on social networks. A study I found on PSKF.com actuually shows an inate desire within humans to share their photos of food. The top reason? Personal food diaries. Even if you don’t sell food/beverage items, provide recipes that are enticing to your target market. 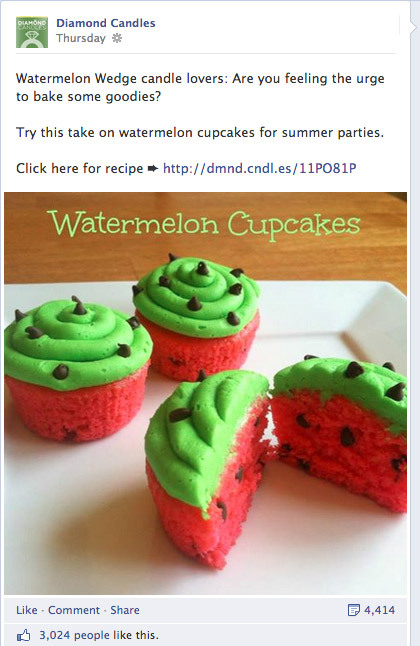 Diamond Candles targets women with their ring-filled candles, so they shared a mouth-watering photo of watermelon cupcakes with a link to a the recipe. Helpful tips like these are how you provide value to your fans and give them a reason to engage and follow you. This recipe also served a dual-purpose by promoting their “Watermelon Wedge” candles! If you really feel stuck trying to relate your products to food, an easy way to do this is to create a cake shaped like one of your products and link to a page where you discuss how you made it. No matter how enticing your link is, some people will not click anything that takes them outside of Facebook. This is usually because they are currently chatting with friends or are in some other way engaged with the site and don’t wish to leave. 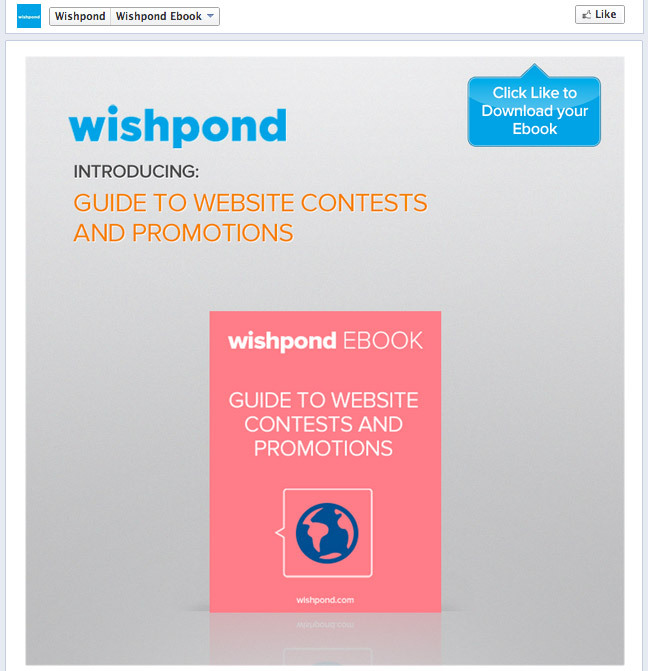 One way to generate more clicks from people who are averse to leaving Facebook is to send people to a Tab on your Facebook Page using a Facebook Contest App, instead of an outside website. This is not always feasible for every situation, but if you’re driving people to a lead-generation form or a piece of content like a video, the page can easily be housed inside of a Tab. You also need to let people know that they’ll be sent to a Tab to get those clicks. 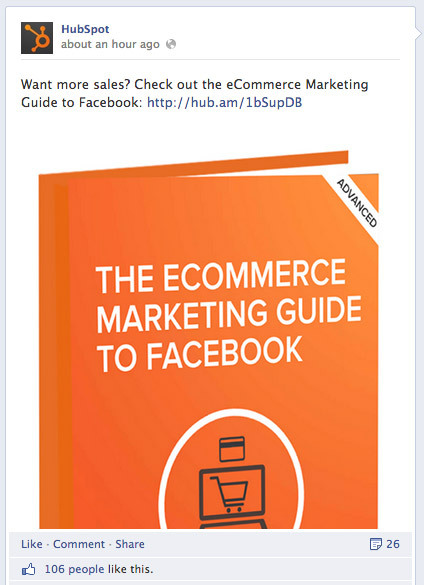 To do this, slightly alter your call-to-action to tell people that the link will take them to your Facebook Page. For example, change “Enter our contest: [LINK]” to “Enter our contest on our Facebook Page: [LINK]”. Links to outside websites is a great way to introduce your fans to long-form content that can’t fit inside of a post. Or to product pages to drive new sales. It can be difficult sometimes to get those clicks, but once you find the right mix of content that your Fans are interested in, it gets easier.